Kaudulla National Park is famous for a large herd of elephants gathering here annually during the second half of the year. The wildlife park is situated near Habarana in Sri Lanka’s North-Central Province, 35 km to the northwest of Polonnaruwa and 35 km to the northeast of Sigiriya by road, or 60 km to southeast of Anuradhapura and 60 km to the southwest of Trincomalee, as the crow flies. 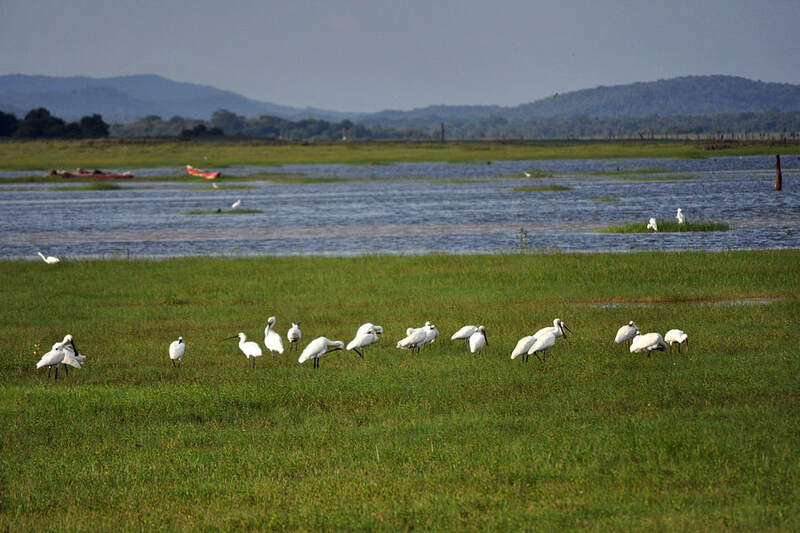 Besides neighbouring Minneriya National Park, Kaudulla is the most significant wildlife zone in Sri Lanka’s north-central dryzone plains now known as the Cultural Triangle, once the heartland of the ancient Sinhalese civilization. Actually, today’s wildlife in Kaudulla is part of that cultural heritage from the Anuradhapura period, as the large numbers of elephants are attracted by grass savannas that would not exist, had the huge Kaudulla reservoir not been built. Thereby, Kaudulla tank is a remnant of an ancient irrigation project from the 3rd century A.D. that continues to benefit human beings and wild animals alike. Kaudalla National Park's main attraction for wildlife enthusiasts is the said seasonal herd of Asian elephants, known as “elephant gathering”, similar to the wildlife event of the same name in neighbouring Minneriya National Park. Kaudulla National Park is situated just north of Minneriya National Park, at the opposite side of the Habarana-Polonnaruwa mainroad (A11). Kaudulla Wewa, an ancient tank also built by King Mahasena in the late 3rd century A.D., is in only 8 km distance from Minneriya Wewa, as the crow flies. By road, the main gate and visitors center of Kaudulla National park is in 22 km distance from Minneriya main entrance and in only 2 km distance from Gal Oya Junction Railway station, where the railroads from Colombo, Trincomalee and Polonnaruwa meet. Like Minneriya, Kaudulla is part of Polonaruwa District in the North-Central Province. Kaudulla National Park is a dry evergreen forest covering an area of 6656 hectares. It is situated on Sri Lanka’s most important elephant corridor, where the largest mammals of the island migrate between Somawathiya and Minneriya National Parks. Along with the tanks of Minneriya and Giritale, Kaudulla also forms an important bird area in Sri Lanka’s northern dry zone. Kaudulla Mational Park is at the western side of the Kaudulla reservoir (6675 hectares in size), whereas the opposite side downstream is the paddy cultivation area of Medirigiriya, the largest agricultural zone of Polonnaruwa District. Large parts of Kaudulla National Park are under water during the local rainy season, as the park area includes several small tanks, which are in close proximity to each other. The average annual rainfall is between 1500 mm and 1600 mm. The rain is mainly from anti-monsoon in November and December. More than 40% of the annual precipitation is from only these two months. Altogether, the four months from October till January contribute 60% of the annual rainfall. The local dry season lasts from April till September. Lowest rainfall is in June. However, the driest period regarding water levels in the park’s tanks is towards the end of the dry season, end of August and begin of September. The vegetation of Kaudulla National Park is similar to that of neigbouring Minneriya National Park, it consists mainly of tropical dry-mixed evergreen forests interspersed with grasslands and shrubs at abandoned chena cultivation areas. Grasslands is also predominant in at the banks of the Kaudulla reservoir, Guinea grass (Panicum maximum) and Cogon grass (Imperata cylindrica) being the dominant species. Animals recorded in the area of Kaudulla National Park include 26 fish and 24 mammal species. The rare Grey Slender Loris (Loris lydekkerianus) has been reported and Kaudulla is Sri Lanka’s only national park where an albino Axis deer has been sighted. Kaudulla harbours 25 species of reptiles. Freshwater turtles inhabiting the park are Indian flapshell turtle (Lissemys punctata) and Indian black turtle (Melanochelys trijuga). 160 bird species of bird are found in Kaudulla, including large water birds such as Grey pelican (Pelecanus philippensis) and the rare Lesser adjutant (Leptoptilos javanicus). Brahminy Kites (Haliastur indus) are the most common birds of prey, Grey-headed fish eagle (Ichthyophaga ichthyaetus) also occur. 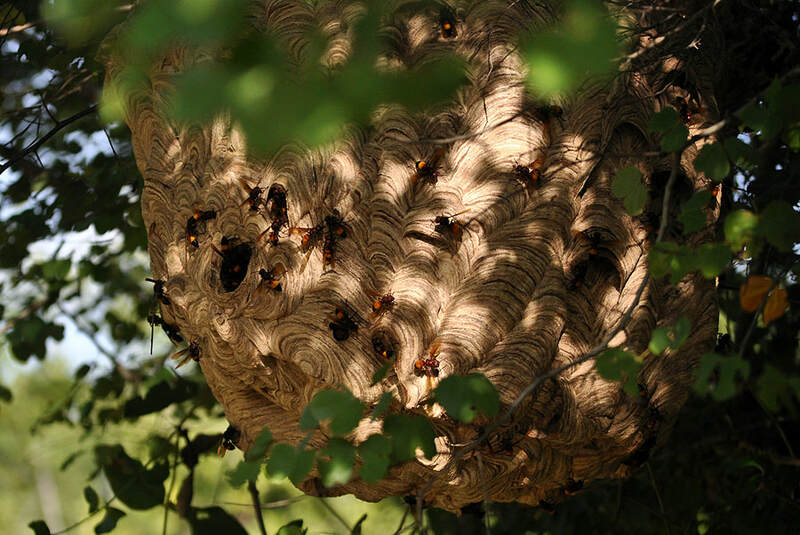 There are several nests of various hornet species along the safari route. The most common hornet in Sri Lanka is the above-depicted Lesser banded hornet (Vespa affinis), in Southeast Asia also known as Common tiger-wasp. The Sinhala name is Debara. Hornets’ nests of this tropical species often carry water-resistant roofs created by saliva. Remarkably, colonies of this species in tropical regions are often founded by up to eight bee queens cooparatively (a phenomenon known as pleometrosis in scientific terms). Being stung by a Lesser banded hornet is very painful and can cause an anaphylactic shock. Cases of deadly attacks by hornets have been reported in Sri Lanka. In particular, attacks of multiple individuals are highly dangerous. Although the Lesser banded hornet is less aggressive than most other speciesof the genera Vespa and Provespa, in tropical Asia, it is this species that causes the most frequent Hymenoptera sting requiring medical treament. The reason simply is that this Vespa affinis the most widespread species. Hornets can sting repeatedly. In contrast to bees, they do not die after stinging, because their stingers are not barbed and therefore not pulled out of the bodies. Not all fatalities are caused by allergic reactions or anaphylactic shocks. The venom can also cause multiple organ failure. When hornets consider their nesting site to be threatened, they attack collectively, which can accumulate to a lethal dose for mammals. Some human victims die within hours or after several days despite medical treatment. Painted Stork (Mycteria leucocephala), named after the distinctive pink tertial feathers of the adults, is considered the most numerous and less threatened stork species in tropical Asia. There are an estimated 15,000 individuals in South Asia and 10,000 in South-East Asia. But populations are declining. 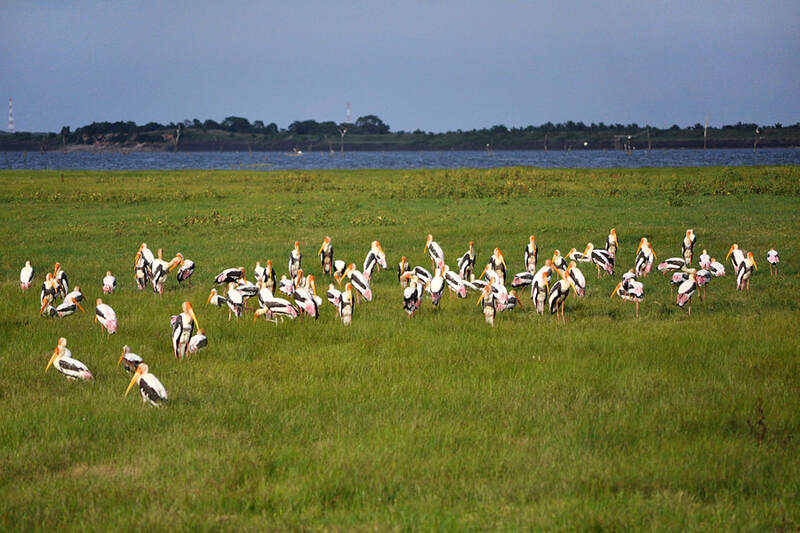 Sri Lanka is the only country, where numbers of resident Painted stork are satisfactory and stable. In the dry zones of the island, Painted storks bread in March to April in Sri Lanka (early dry season), whereas breading seasin is December to March in southern India (mid dry season) and August to October in northern India (wet season). Outside India and Sri Lanka, amounts of several thousands only occur at Lake Tonle Sap in Cambodia, whereas the species has become rare in all other Southeastasian countirs. It has become scarce too in Pakistan and Bangaldesh, where it is confined to the delta regions. In the lowlands of Nepal (Terai region), Painted storks are very rare summer visitors. In tropical China, the species is almost extinct now. Suficient regional numbers provided, Painted storks typically forage in flocks in shallow waters of rivers, lakes and open swamps. White storks (Ciconia ciconia) occur in Sri Lanka, too, but only in the Northern Province, as migrants. Large herds of water buffaloes are often sighted in Kaudulla National Park. Though some buffaloes are owned by villagers, most of the individuals inhabiting the park live in the wild permanently. Nonetheless, it’s not correct to call them “wild buffaloes”. Wild water buffaloes (Bubalus arnee) are a destinct species, which is very rare or even extinct in Sri Lanka. Although indigenous wild buffaloes are said to occur in Sri Lanka, almost all buffaloes roaming freely in Sri Lanka’s wildlife areas are feral animals. The paradoxical result is: Numbers of feral buffaloes come close to overpopulation in Sri Lanka, whereas wild bufallos are critically endangered. 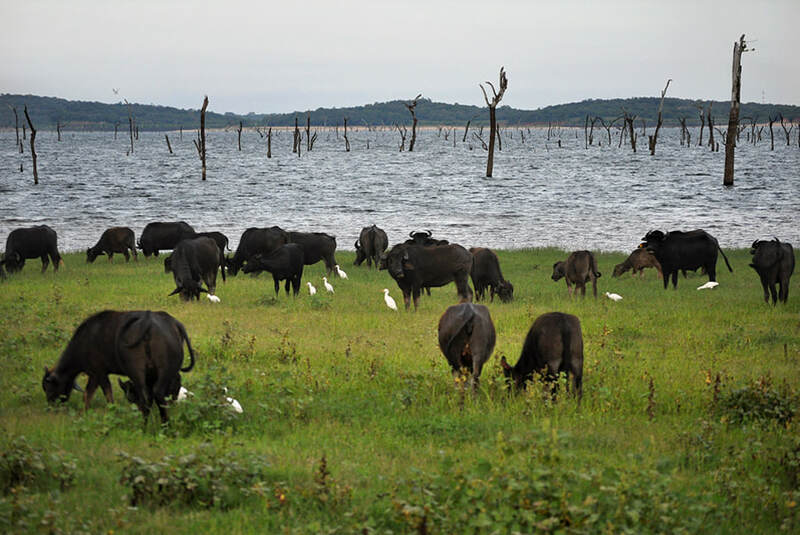 Large herds of water buffalos will rarely be seen without Cattle egrets (Bubulcus ibis) sitting on their backs. Cattle egrets sometimes hunt fish and frogs like other wading birds do. But usually they follow herds of livestock to eat bugs that bother the cattle as well as grasshoppers that are stirred up by the cattle’s hoofs. In colour, shape and size, Cattle Egrets are similar to Little Egrets (Egretta garzetta). They are distinguished from Little Egrets by shorter and thicker bills that are yellow and not dark. Populations in Sri Lanka are significantly increased by winter influx, since some populations of cattle egrets are migratory. However, there is also a significant amount of breeding grounds of sedentary Cattle Egret populations on the island. The Common Spoonbill or Eurasian Spoonbill, the only spoonbill species occuring in Sri Lanka, is one of the most widespread species of waders on the island. They are easily discerable due to the distinctive spoon-shaped widening of the bill’s tip. Both Eurasian spoonbill (Platalea leucorodia) and Little Egrets (Egretta garzetta) are very common waterfowl species in Sri Lanka, they can often be seen together, forming mixed-species foraging flocks. As a matter of fact, the presence of Eurasian Spoonbills increases the chance of Little Egrets being present. Little Egrets foraging in association with Eurasian Spoonbills are recorded to have higher pecking and prey intake rates than their solitary conspecifics. This is all the more remarkable, as territoriality of Little Egrets is strong when feeding alone or within aggregations. They defend feeding sites and individual distances against nearby birds, including some other species such as night herons. However, they are seen foraging commensally not only with spoonbills but also by following such diverse species as diverse as cormorants (Phalacrocorax), ibis (Threskiornis), or even jackals (Canis). Similar to Cattle egrets, they occasionally also follow cattle and ride bathing water buffaloes. 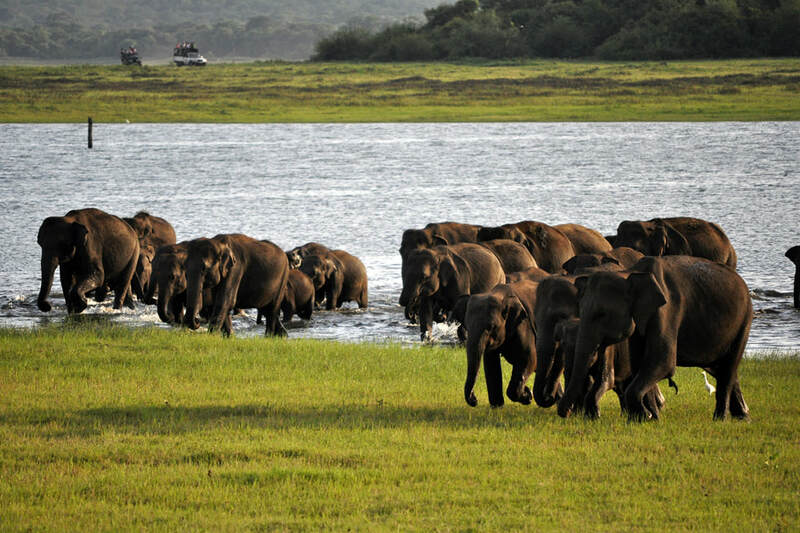 Sri Lanka’s major wildlife event called “elephant gathering” takes place 12 km south of Kaudulla Wewa, at Minneriya Wewa in Minneriya National Park. However, Kaudulla National Park has an elephant gathering, too, though not on such a huge scale. In fact, there is more than one elephant gathering in Sri Lanka. 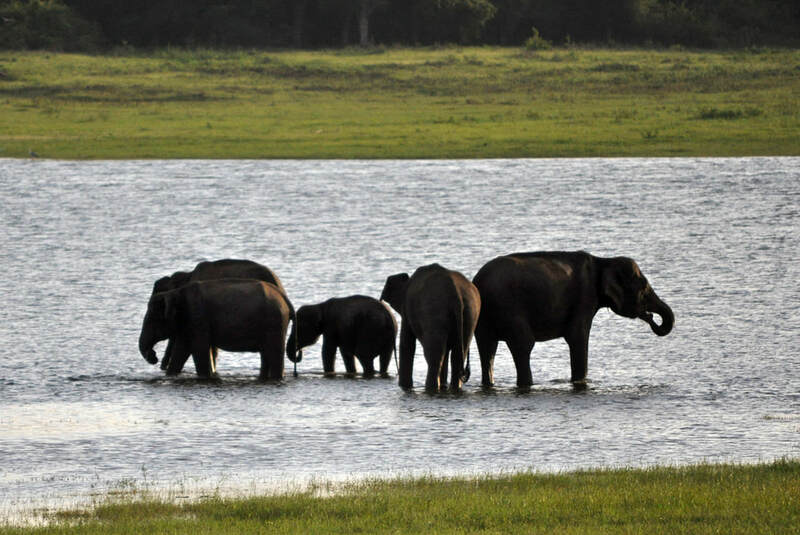 Before migrating in small groups to Minneriya, large herds of elephants can be seen Wasgomuwa National Park to the south of Polonnaruwa’s huge reservoir known as Topa Wewa, particularly in April. 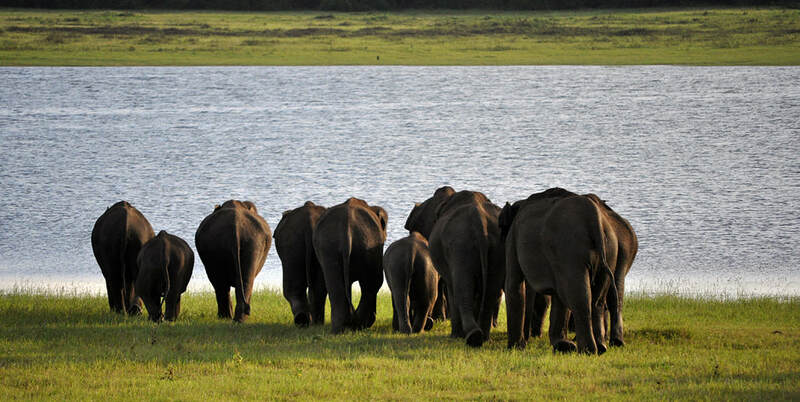 The elephants from Wasgamuwa in the south meet with those from the north at Lake Minneriya. This is why the summer months elephant gathering in Minneriya National Park is unsurpassed considering the numbers of elephants. However, there are more elephants arriving from the north, about 250. They have to cross Kaudulla National Park, which belongs to the Sri Lanka’s main elephant corridor. Not all of them proceed to Minneriya. Many stay at Kaudulla during the dry period and join the population of more than 100 resident elephants. This seasonal herd, though smaller in size than that of Minniriya, is still impressive, about 50 or 70 individuals can be sighted bathing together in Kaudulla Wewa and feeding and socializing on the grass plains at its banks. In October, when the raining season begins, most of the elephants return from Minneriya. Those migrating northwards cross Kaudulla National Park. Many of them stay near the Kaudulla grasslands for a few weeks before travelling further north to their destinations and homelands in densely forested areas. This is why in or around late October and early November Kaudulla has many more elephants than usual, when, at the same time, no elephant gathering takes place at Lake Minneriya any more. During this northern autumn period, herds of about 100 or even up to 200 jumbos can be seen at Lake Kaudulla every afternoon. This is actually near the size of the summer elephant gathering in Minneriya National Park. Therefore, it makes sense to call this spectacle “Kaudulla elephant gathering” or “Sri Lanka’s second elephant gathering”. The best periods of time to visit Kaudulla National Park are the end and peak of the dry season in August ans September, when a smaller elephant gathering takes place concurrently to that at Lake Minneriya, and October till December, when there are less elephants in Minneriya than in Kaudulla National Park. However, elephants can be sighted year round in Kaudulla National Park. Elephant safaris should start about 3.00 p.m. and usually run for three hours. Jeep safaris booked in advance often include pick-up at a hotel in Habarana. Birdwatchers can also enjoy a ride in a paddle-boat on Lake Kaudulla. Honestly, apart from elephant safaris and birdwatching, wildlife experiences are less amazing in Kaudulla than in Sri Lanka’s larger national parks. Besides elephants, only the numbers of feral buffaloes are actually impressive in Kaudulla. During northern hemisphere summer months, some guests prefer to see the Kaudulla elephant gathering instead of the larger spectacle in Minneriya, because then Kaudulla is not as overcrowded with jeeps as Minneriya. Kaudulla National Park as an alternative to the “big gathering” is worth considering indeed. In order to avoid disapointments regarding experiences of “lonely wilderness”, we should mention: Although there are actually significantly less jeep tours during elephant peak season in Kaudulla than in Minneriya, Kaudulla has become quite popular with elephant safari tourists in recent years, too. Instead of seeking tranquility, you should expect a the experiential value of an event. Then the Kaudulla elephant gathering will not be disappointed you between August and December. If you are satisfied to see only a few dozens elephants, Kaudulla will probably be a very quiet place off the beaten path during the first half of the year, particularly in May and June. If the number of elephants matters most: Local guides and even plenty of guest house owners know where the elephant gathering takes place at any given time. As already mentioned, the best time of the day to observe big herds is the late afternoon. 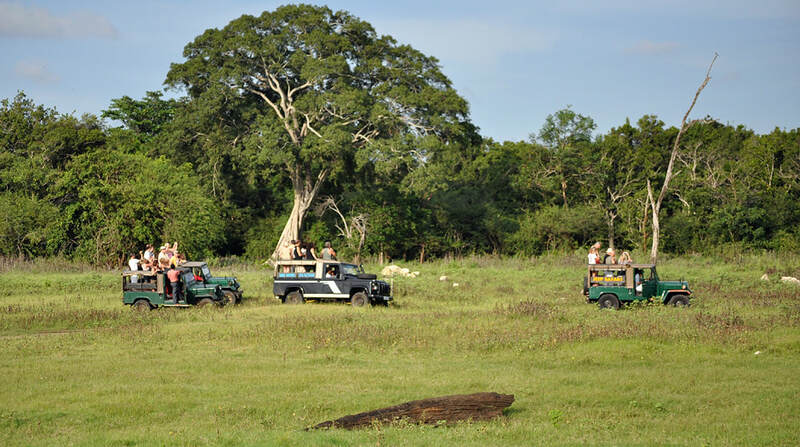 Tented safaris can be organized in Kaudulla National Park. The hotels next to the park are found in Habarana, in 22 km distance from the park entrance by road, the high end being Cinnamon Lodge and the adjacent Habarana Village by Cinnamon. Several guesthouses are available Minneriya town in just 13 km distance from Kaudulla’s visitors center. Most probably, Kaudulla was one of the 16 irrigation tanks built by King Mahasena, one of the most remarkable kings of Sri Lanka’s history. In the chronicles, the tank is mentioned as Tissavaddamanaka. But local legends have it, that it was actually Mahasena's sister, princess Bisobandara, (or according to other versions his wife) who constructed the tank clandestinely, with the help of a minister named Krishna. The construction work was done only during nighttime in order to avoid detection. But a speaking Black drongo (Dicrurus macrocercus) disclosed the secret to King Mahasena, who was building the Minneriya reservoir during the same period. In size, the second tank rivalled or even surpassed the royal Minneriya tank. In memory of the being that made its existence known to the king, the second reservoir got the bird's name: The Sinhala term for “Black Drongo” is “Kauda”. In 1959, the tank was restored as part of an irrigation scheme in Ponnaruwa District. It soon attracted a variety of plant and animal life, including fish and reptiles. 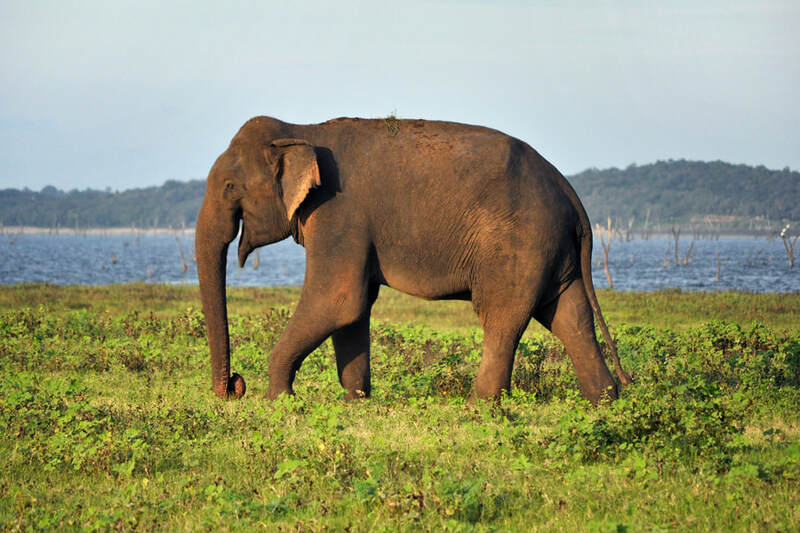 Kaudulla National Park was established in 2002 to protect the most important section of Sri Lanka’s northeastern elephant corridor, in order to protect migrating elephants and to avoid human-elephant conflicts. Sri Lanka’s 15th national park is still the island's newest wildlife reserve, as smaller national parks gazetted later on have no big animals. The establishment of Kaudulla national park threatened villagers with a loss of livelihood. This led to conflicts in the first year. Then both sides opted for a cooperative way. The villagers refrained from illicet felling of timber. On the other side, the Wildlife Conservation Department decided to allow fishing at certain times and to tolerate grazing of cattle occasionally, although it is illegal within national park boundaries and highly problematic. Depriving the elephants of their food increases the risk of movements of migratory elephants to settlement and agricultural areas and thereby causes human-elephant conflicts. But there are no adequate grasslands available as feeding grounds for the cattle of the villagers otherwise. Arrangements have been made to develop additional grassland outside the boundaries of Kaudulla National Park and to provide the villagers with higher yielding milk cattle.